Cincinnati Reds starting pitcher Tyler Mahle throws in the first inning of a baseball game against the Chicago Cubs on Monday. His six shutout innings helped the Reds to a 1-0 win. CINCINNATI (AP) — Four days into the season, the Reds finally got their opening-day parade — and a win, too. The Cubs? Still trying to locate their offense. 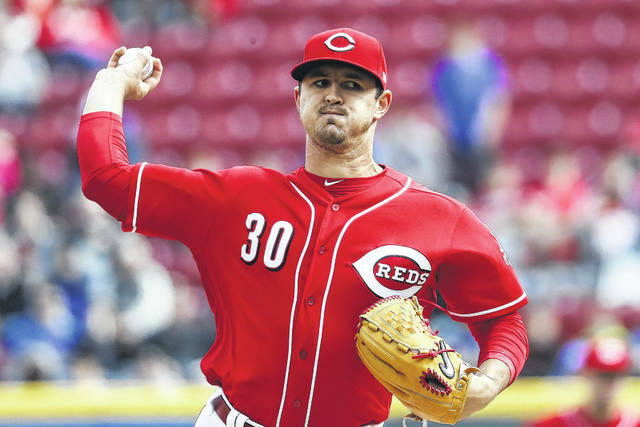 Rookie Tyler Mahle pitched one-hit ball for six innings, Raisel Iglesias fanned Anthony Rizzo with the bases loaded to end the eighth, and the Reds edged Chicago 1-0 Monday for their first win of the season. Cincinnati was swept at home by Washington, falling to 0-3 for the first time since 2003. It also trailed in all 27 innings — the Nationals scored in the first inning each time. After their traditional opening parade, the Reds finally got a lead, too, when Eugenio Suarez tripled in the fourth and scored on Adam Duvall’s groundout. Mahle (1-0) earned the victory in only his fifth major league start, outpitching Tyler Chatwood (0-1) in his Cubs debut. The Cubs were coming off a 6-0 loss in Miami and managed only four baserunners against Mahle , who walked two, hit one and struck out a career-high seven. Ian Happ singled in the eighth, but Iglesias came in later and got Rizzo to swing through a high fastball to escape. Iglesias got last four outs for the save. Rizzo is 1 for 7 with runners in scoring position this season and batting .130 overall, a slump he figures won’t last long. Chicago has been blanked in back-to-back games for the first time since last May 26-27, when the Dodgers beat the Cubs 4-0 and 5-0. The Cubs also were held to one run during a 17-inning loss in Miami. The Cubs stranded 42 runners while splitting the four-game series in Miami. They stranded four in scoring position on Monday. They’re hitting .137 with runners in scoring position. Chatwood signed a three-year deal with the Cubs after going 8-15 with the Rockies last season. He gave up four hits, walked six and threw only 49 strikes out of 92 pitches. “Tyler’s command was not as sharp as it can be, but he made pitches when he had to and the pitches he made were really alive,” Maddon said. It was essentially a Re-Opening Day in Cincinnati, which didn’t get to hold its annual parade last week. The market association that organizes the parade was busy with Easter sales, so it was moved to Monday, with Sam LeCure and Danny Graves as the grand marshals . The game drew 18,963 fans on a cold afternoon, many of them wearing Cubs blue. The Cubs are 40-18 against the Reds over the last four seasons, the best winning percentage by any Reds opponent. They’ve won 30 of the last 42 between the NL Central rivals. Suarez’s triple in the fourth inning was his first since June 6 against St. Louis. 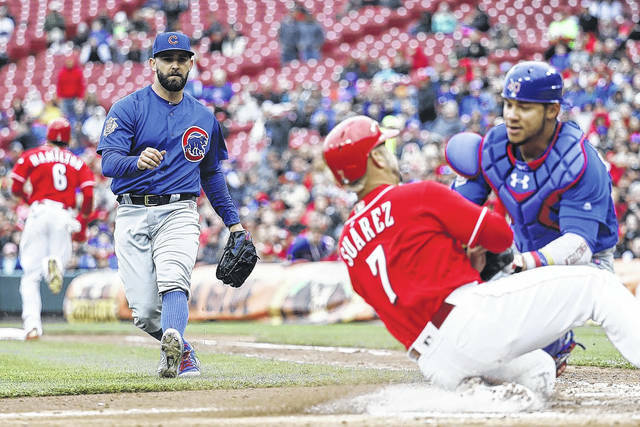 … The last time the Reds had a two-hit shutout against the Cubs was Aug. 14, 2013, at Wrigley Field — Bronson Arroyo, Alfredo Simon and Jonathan Broxton combined. Rizzo was hit on the left foot by a pitch in the first inning. Reds outfielder Scott Schebler was scratched because of a sore right elbow, which was hit by a pitch on Sunday. He’s day to day. Cubs left-hander Jon Lester (0-0), the starter today, gave up four runs — three earned — in only 3 1/3 innings of an opening 8-4 win at Miami. He’s 5-1 with a 4.27 ERA in 13 career starts against the Reds. Reds left-hander Cody Reed (0-0) will start in place of the injured Brandon Finnegan. Reed has lost each of his three career starts against the Cubs, giving up 22 runs and seven homers in 10 innings. Chicago is batting .360 against him. https://www.limaohio.com/wp-content/uploads/sites/54/2018/04/web1_Mahlie.jpgCincinnati Reds starting pitcher Tyler Mahle throws in the first inning of a baseball game against the Chicago Cubs on Monday. His six shutout innings helped the Reds to a 1-0 win.